Collection from your hostel/hotel/airport by 09h00 and drive to Tremisana Lodge. Sunset Drive on open Landcruiser and Bush BBQ at Marula Boma. After dinner sleep out on comfortable mattresses on an elevated platform overlooking a waterhole while listening to hyenas, lions and sounds of the African bush. Coffee and rusks and then a 2h walk before breakfast. 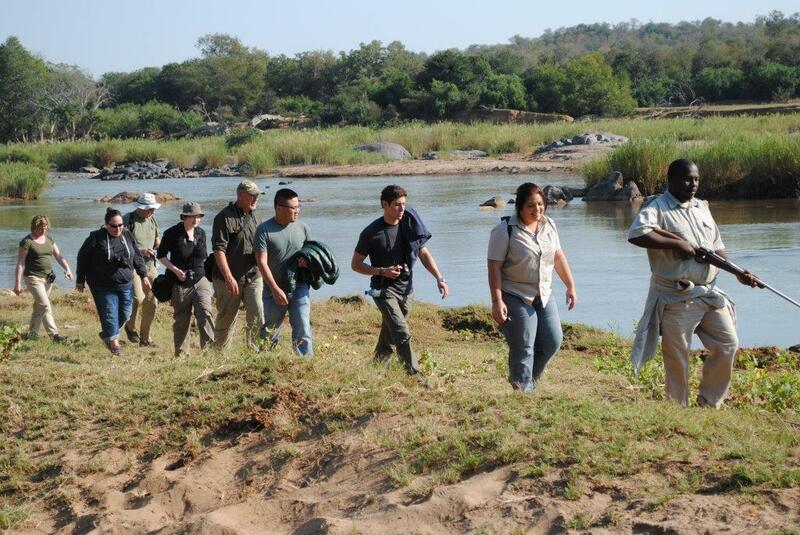 Drive to our concession where we enjoy a 3h walk to the Olifants River. Drive to Tremisana for lunch. After a rest and a swim, we go on a game drive, returning to Marula Boma for dinner and overnight. On arrival at Marula Boma, you will receive a bag that contains a pillow, a sleeping bag, a towel, a blanket and insect repellent. Please look after this bag and return it to management at Marc’s Treehouse Lodge on the day you depart. There is a shower with hot water at Marula Boma and a soap dispenser is provided. We have a flush toilet. In the event of extreme weather, we may use a thatched room with 4 double bunks. Mattresses are placed on the platform. We can fit a maximum of 8 mattresses including one for the armed guard who accompanies you. From the platform there is an unobstructed 360 degree view of the bushveld – really impressive ! There is a waterhole about 25 metres from the platform. Our guide has a strong torch and when we hear activity at the waterhole, he will illuminate the animal. Please be quiet as animals will avoid coming to the waterhole if there is excessive noise. There is no electricity at Marula Boma. On day two you go on an extended walk so you need good walking shoes and neutral coloured clothes. You return to Tremisana for brunch. After brunch you can rest near the pool or at the bar where there is Wi-Fi. There are electric outlets where you can charge all electronic items. We have a shower available at Tremisana designated for our sleep out guests. Your luggage can be stored in the office at Tremisana. After a second walk in the afternoon, you return to Marula Boma for dinner and your second night on the platform. On day three you take all luggage and arrive at Tremisana in time for breakfast. Today you are doing a full day safari on an open vehicle in Kruger. Your luggage and bag will be taken for you to Marc’s Treehouse Lodge. Tonight you sleep around a fire and will have a view of the illuminated dam. Again, should there be inclement weather, we have provided a covered room for your use. Hot water shower and flush toilets are located nearby.